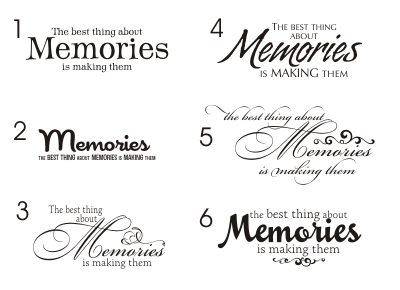 This phrase was a custom request and I thought it was so darling that I made six possible designs. Except now, I can't decide which to feature in our online wall quote collection. Help! Tell me, what's your vote? Number 6 for sure!! So cute!! I love that quote. One day when I own my home I'm going to have you guys make me a quote that says "running through the kitchen naked while eating ice cream" but in Italian. Your guys are awesome!! I like #4. It was fun to meet you both at HOSB today. Good luck with everything you are working on!